Milwaukee -Credenciales USA is buying support from a local Spanish magazine, paper, and radio to promote their alleged scam which offers worthless IDs and International Driving permits to immigrants. El Conquistador Newspaper contacted on Tuesday Celio C. Palacio R. the editor/director of El Diario de Milwaukee, and Arnoldo HernÃ¡ndez the general director of Latinos al DÃ­a after noticing their publications published a press release from Credenciales USA criticizing El Conquistador for exposing their dubious practice in selling useless IDs. La GranD 104.7 FM airs a half hour radio program from Credenciales USA on Saturdays morning. These media outlets are claiming Hugo Loyo from Credenciales USA, 3031 W. Lincoln Ave. has paid them to promote the alleged scam by printing his press release, and airing his radio program to lure unsuspecting victims. Even though, the management from these outlets are aware of the alleged ID scam. Their reasoning to help promote the scam is based on getting paid to advertise from Credenciales USA. Despite knowing immigrants who read their publications, and listen to the radio program are getting ripped off. It seems, Palacio, HernÃ¡ndez and the management from La GranD lack any ethical safeguards and standards to protect their readership and radio listeners from alleged scams. In this case, they put profits first then protecting their readership and listeners from dubious practices from Loyo, Credenciales USA and Banco Amex International LLC. 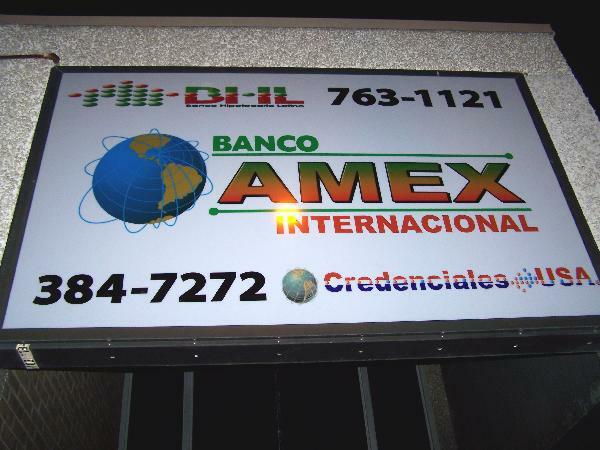 Local banks, the Mexican Consulate of Chicago, and others in the area have made it clear that they do not accept Credenciales USA IDs for identification purposes or to open bank accounts, and board domestic flights as Loyo claims. Numerous clients that purchased IDs and International Driving permits from Credenciales USA have discovered they are worthless after trying to use them for identification and driving purposes. Voces de la Frontera, 1027 S. 5th St. are seeking victims from the alleged ID scam who are willing to come forward. Palacio who is originally from Peru says, he was paid twice to put the press release by Loyo. He emphasized that he keeps only one copy of each issue of his Diario for up to three weeks and then discards it. HernÃ¡ndez who is originally from Guatemala says he also was paid by Loyo to print the release regardless of content, and two display ads including one for Banco Amex Internacional LLC. Banco Amex Internacional is actually licensed as a mortgage company, according to an employee. The owners have been deceptive by using Banco (bank) instead of a mortgage company. HernÃ¡ndez added that Loyo has not been charged of a crime yet, and ignores a well known fact that Credenciales USA IDs are not accepted in financial institutions, the Mexican Consulate of Chicago, and in any government entity. La GranD says the management decided to put a disclaimer at the end of Credenciales USA radio program. Regardless, Palacio, HernÃ¡ndez, and La GranD are solely responsible for what they print and air, according to a state official. On Wednesday, Primitivo Torres, the Customer Service Manager at U.S. Bank on 939 W. Mitchell St. contacted both Palacio and HernÃ¡ndez after noticing Credenciales USA advertising in their publications. Torres told both men that numerous people have come in to the bank trying to open accounts with Credenciales USA IDs and were rejected. â€œSome of the people left the bank with tears in their eyes after discovering the IDs were not accepted to open accounts, and itâ€™s heart breaking to see these hard working people being taken advantage off,â€� said Torres. Both El Diario de Milwaukee and Latinos al DÃ­a do a disservice to our community by allowing Credenciales USA to publish ads in their publications to reach unsuspecting victims, added Torres. U.S. Bank will accept from country of origin a passport, and a Matricula Consular, as secondary IDs a driverâ€™s license, and an elector registration card, also an ITIN number can be used, and a state ID to open bank accounts, according to Torres. El Conquistador Newspaper, Representative Pedro ColÃ³n, Voces de la Frontera, local banks, and the Southside Organizing Committee have joined efforts in exposing and warning the Latino community about the worthless IDs Credenciales USA has been selling to unsuspecting immigrants in the South side. Palacio, and HernÃ¡ndez by printing Loyoâ€™s release, affirms to their readership that their publications puts profits first then protecting them from alleged scams. In this case, Palacio, HernÃ¡ndez, and Loyo do a disservice to our entire community by encouraging Mexican nationals to scam Mexican immigrants. El Conquistador Latino Newspaper and its staff will continue to advocate and protect our readership from being scammed by unscrupulous businesses, groups, and individuals whose only concern is to make money through dubious practices, and taking advantage of our immigrants. Undocumented immigrants are less likely to be protected by the law due to their unwillingness to come forward for fear of being deported. Authorities have said everyone in the community is protected by the law from illegal practices, despite their immigration status. The Milwaukee County District Attorneyâ€™s office is currently investigating allegations of worthless IDs being manufactured in the area by Credenciales USA. The Wisconsin Department of Justice when contacted would not confirm or deny an investigation concerning Loyo, Credenciales USA, and Banco Amex Internacional LLC.